It’s been hurricane season here in North Carolina for awhile now – so preparing might have already been on your to do list. But sometimes, it takes a big storm to bring the value of being prepared to the forefront. As we all watched the devastating impact of Hurricane Harvey – our hearts, hands and wallets opened up to assist. Now, we see one potentially headed our way – and it’s time to make sure that we are ready, as well. Please take a few moments and do the following – while we wait for Hurricane Irma to decide her path. Sign up for ReadyWake if you haven’t done so already. In partnership with Wake County, the Town of Cary will notify you via your preferred means of contact (phone, text and email) when there is an imminent threat to life, health and property. Sign up and get information directly on the device of your choice. You can also download the ReadyNC app for iPhones and Android phones. It has information like road conditions, power outages reported, areas that are being evacuated, and where open shelters are near you. You can also find this information on the ReadyNC webpage. You’ll find lots of great information that should be updated as Irma gets closer. Create your own support network and an emergency communication plan. That way, you’ll know of family, friends and neighbors, and have their contact information to help you, or you help them, in an emergency. Know where and how you will all connect if various communication routes are down, and where you might go if you need to evacuate. Reach out and tell them what you might need. Think about what you need for you and your family. 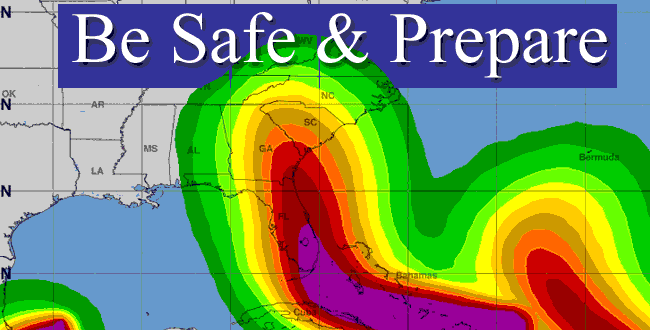 Check out FEMA’s Plan & Prepare site for some great tips. – Do you have pets? How will you care for them? – Do you have children and/or seniors? What special arrangements might you need? Protect your important documents/valuable and make sure you document and insure your property. – Make sure to have items ready in your emergency supply kit – like family records, wills, deeds, social security cards, bank information, medical and tax records, and medical cards and prescriptions. – Take pictures of your property – and upload them to a Cloud based service (like iCloud, Box, Dropbox) so your information is in the cloud, not just on your computer and backup drive. Emergency Supply Kit – This one is something you can do by collecting items above, and/or heading out to the store. You need to make sure you have enough water, food and supplies for 3-7 days. I remember we were without power for 7 days when Fran hit – and I was glad to have some of these items at the ready.Here are some suggestions from a variety of websites. (By the way, I’m not opposed to adding things like chocolate brownies (my must have, I might need to make some now) and beer or bourbon (a request by some family members and friends) – make this YOUR kit. Also make sure to include the items mentioned above. One other tip: I also put some of my gallons of water in the freezer – that way I can use them if I need to keep food cold if we are out of power. (Make sure to take some water out of the bottle, as they expand when they freeze.) And start stocking up on your ice cubes, too. Pet needs (if you have them). 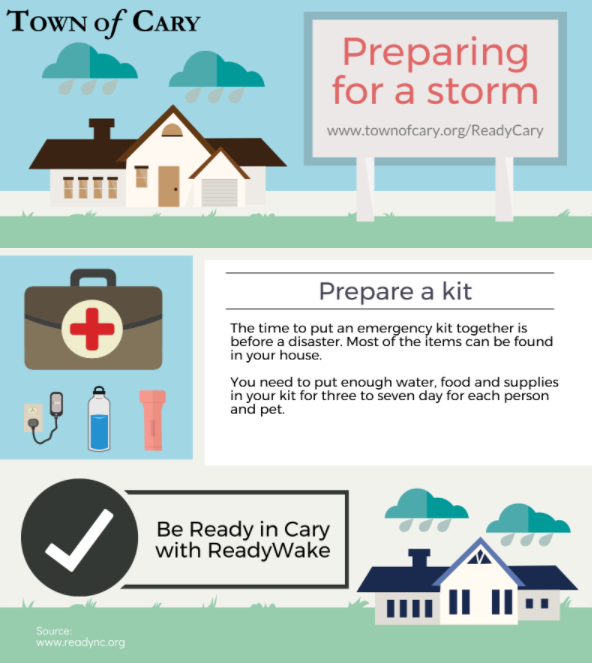 The Town of Cary, Wake County and others will be posting on social media, and alerting citizens as the Hurricane moves closer. You can follow their Facebook pages (Town of Cary, Wake County) and their Twitter feeds (Town of Cary, Wake County, ReadyWake). Please be safe and prepare. We can always replace stuff, we can’t replace you or your loved ones. Feel free to comment on any tips and tricks you have for preparing, I’d love to hear from you. Also even if a natural disaster is not immediately threatening your family, it’s a good idea to keep an emergency kit in your home and make sure the entire family knows exactly where it’s located. That way, if there’s any type of emergency or disaster, your family will know where there are supplies to help. For each natural disaster scenario, consider sitting down with your family and making a plan, so everyone knows where to go and what to do in case a natural disaster occurs. Thank you for making this blog, Lori. If a Category 5 Hurricane such as the one forming in the mid-Atlantic route patter from Africa to the Caribbean Sea and the Eastern Coastline of the United States of America actually arrives to North Carolina the massive size will reach far inland with heavy rainfall causing surface flooding and the high winds could certainly knock out electrical transformer power supply stations all around the Triangle area of Central North Carolina. This is a worst case scenario but certainly not out of the question. Be prepared and do not drive your vehicle into water covered roadways! I would love to have any information that you have. As a little girl, I remember Hazel so I do not welcome this “Florence” into our area.